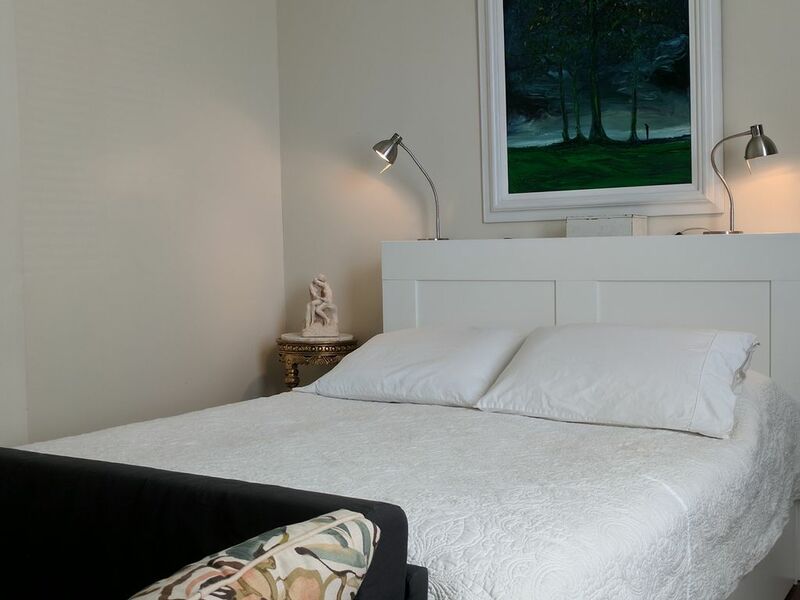 This historic home has been carefully designed to provide a very #cozy stay. The independent one bedroom apartment/studio is extremely well equipped for #comfortable modern living, even for long term stays. You will enjoy the laziness of the backyard, sitting in the front porch while the interesting characters that live in the Bywater go about their businesses. An stroll through the neighborhood is a wonderful experience. Single sink, reasonable storage and fluffy cotton towels . It's an old house, so it is not next to the room but all very accessible. Some our neighboring businesses operate as resorts and spas. Washer/dryer combo and In the backyard a full laundry room shared with the house. Seating and working space. Art work all through. Beautiful courtyard, now being built. Great place in a perfect little neighborhood! Truly was the perfect little place in a perfect neighborhood! Where else can you have a coffee shop, several amazing restaurants, a grocery store and a country club with a swimming pool within couple blocks? We had an amazing time and our hosts were great and prompt with response with any questions. We even got to meet Gustavo and see his art studio. Fascinating guy! Truly a wonderful time! Wonderful stay and great location! Our hosts, Matilde and Gustavo could not have been sweeter! We felt like we were family as soon as we met them. The apartment was comfy and quiet. Be sure to tour their art gallery/studio if given the chance. The artwork is beautiful. Plenty of amazing little restaurants in the Bywater neighborhood. Easy walk to the French Quarter as well. This is a wonderful little bungalow in the back of an Artist's studio. We met the artist Gustavo Duque and saw his wonderful studio but most impressive was that he is doing an exhibit to support underprivileged African students interested in medicine a chance at becoming Doctors and other Medical Professionals. The exhibit starts April 12th at 6pm at the New Orleans Art Center, 3330 St. Claude Avenue, New Orleans, LA. The exhibit will be on display from April 12 through May 6th.I believe it then moves to Texas then Atlanta, GA.
Also Gustavo's wife Matilde Alberny is an artist and she manages the apartment. We did not get to meet her but seemed like a lovely woman. Some of her artwork was in the apartment as well as the studio. What we liked about this place was that it was in a nice quiet residential neighborhood with lots of vegan and vegetarian restaurants, shops and stores nearby many that cater to the vegan and vegetarian, yogic lifestyle, plus hidden gems like Gustavo's art studio and others. Also, so close to the French Quarter, Frenchman Street and the city itself. We did not have a car and made it around town just find with uber. I highly recommend this place. We had a wonderful time! The home was nice but can stand a few things like a ironing board, new shower curtain liner , paper towels & maybe Aired out when not in use ( we had to burn a candle) to get the old house smell out. Paper towels and ironing board are in the apartment. We will do the curtain liner, for sure, thanks for letting us know. Comfortable place to stay and beautiful location! We had a good experience! Overall the place is comfortable and easily accessible. It was perfect for two people. The bed was good, but just a bit difficult for two people accustomed to a king size. This exquisitely elegant, quiet and comfortable apartment is located in historic district of Bywater, once considered a bohemian neighborhood now housing a hipster crowd with it's laid back charm. It is located in Dauphine, between Louise and Clouet surrounded by most of the shops, restaurants, artists shops, bars and coffee places of the neighborhood. It is very pleasant to stroll down or ride a bike by Dauphine, Royal or Chartres Streets. RULES REGULATIONS Tenant(s) must maintain a standard of behavior consistent with the consideration necessary to provide reasonable safety, peace and quiet to the other residents in the building or neighborhood. Tenant(s) should not be boisterous or disorderly, create undue noise, disturbance or nuisance of any nature or kind, engage in any unlawful activities. If a violation occurs Tenant may be declared in default by Landlord and Landlord will demand the rent for the whole unexpired term of the lease which shall at once become due and payable and obtain possession of the premises and may elect any other remedy allowed by law.